Baking a chocolate cake can make you the most popular kid on the street from its smell alone! There is an allure to the scent of chocolate wafting through the air that excites, seduces, and summons everyone to the kitchen, eager to get their hands on your glorious creation! This vegan version is rich, moist, and somewhat tropical from the addition of coconut and avocado icing. Instead of eggs, there is a mashed banana which is an excellent replacement in vegan baked goods and adds a subtle yumminess. Avocados work wonderfully as icing. They are naturally creamy and do not require much work to be transformed into a sweet topping. In fact, they are usually consumed with sugar throughout South East Asia in this blended form, so if you have extra icing sitting in the blender, eat it with a spoon! This is a fairly easy recipe as the oven does most of the work for you. In a mixing bowl, combine flour, sugar, cocoa, baking powder and coconut. Grease a baking pan of your choice and pour the batter in. Remove from the oven and allow to cool before icing. Blend until uniform consistency, adding more liquid if needed. 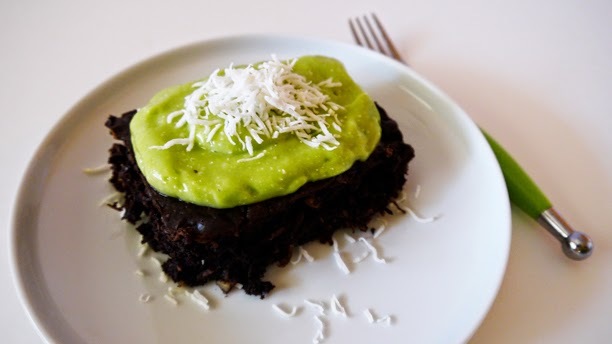 Once cake has cooled, spread a generous layer of avocado mixture and serve. *tip: Avocado's don't last long, so ice the cakes per serving rather than doing the entire cake at once.